Looking for the perfect present? Something different, yet unique and very personable. Shop no further. 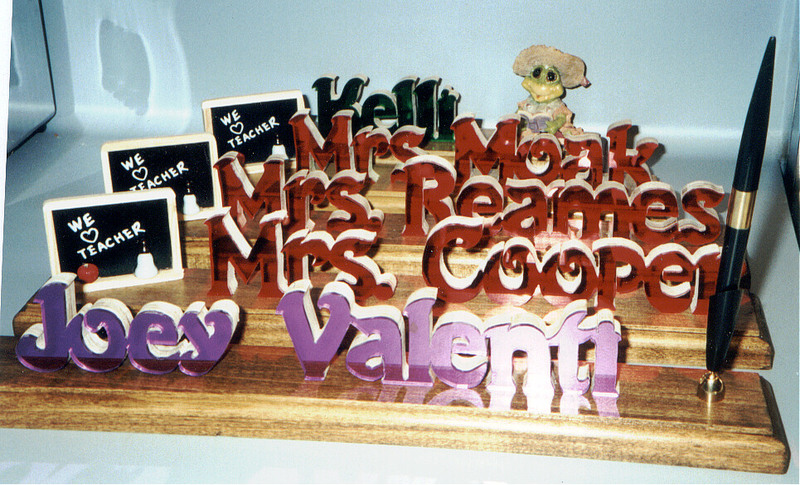 You have found The Perfect Present, personalized nameplates of all kinds. You design it and we make it. Just fill out the "Order Form" with the design of your choice and mail it to us. It will be made and shipped to you within 2 to 3 weeks. Prices and more details are listed on the "Order Form Page". These nameplates make wonderful gifts for any occasion. They are great for birthdays, Christmas, graduations, teacher gifts, etc. Everybody can use a nameplate for their desk. Nameplates are made of a specialized material which resembles mirror. This material comes in four different colors. The colors are green, blue, purple, and red. The name is cut from the mirrored material, backed with wood, then placed on a solid wood base. Approximate height of letters are 1 1/2" to 2".